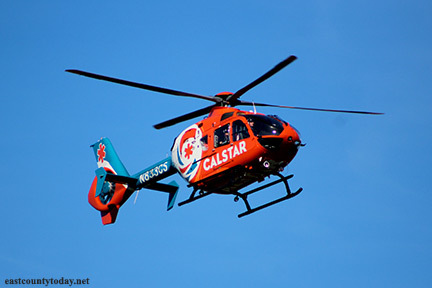 At 1:48 pm Monday, the East Contra Costa Fire Protection District responded to a report of a motorcyclist who was struck by a vehicle in the 3200 block of Walnut Blvd. in the City of Brentwood. It was reported that the motorcyclist was alert and conscious, however, was likely suffering from broken bones and it was also stated his helmet flew off during the crash. When arriving on scene, Battalion Chief 5 reported three patients with one minor injury, however, he requested a second Code 3 AMR unit. A medical helicopter was requested to Belvedere Park off Walnut with the motorcyclist who was sustaining ride-side trauma with a femur trauma, possible abdomen injury.